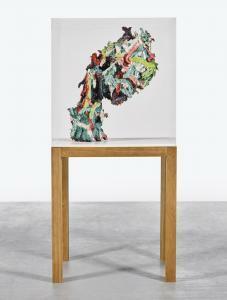 Find artworks, auction results, sale prices and pictures of Glenn Brown at auctions worldwide. 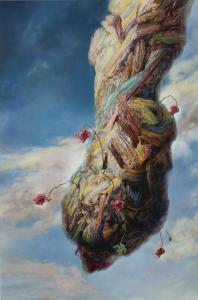 Glenn Brown THE REVOLUTIONARY CORPS OF TEENAGE JESUS B. 1966 signed, titled and dated 2005 on the reverse oil on panel 145 by 97.2 cm. 57 1/8 by 38 1/4 in. Patrick Painter Gallery,Santa Monica Acquired from the above by David Teiger in 2005 Exhibited Los Angeles, Patrick Painter Gallery, Glenn Brown, April - May 2005 Liverpool, Tate Liverpool; Turin, Fondazione Sandretto Re Rebaudengo, Glenn Brown, February - October 2009, p. 115, illustrated in colour Literature Balthasar Burkhard, \‘Kai Althoff, Glenn Brown, Dana Schutz\’, Parkett,No. 75, 2005, p. 129, illustrated in colour At the heart of all of Glenn Brown\’s paintings is an image. This image is most commonly a painting by a canonical artist, often by an expressionist such as Willem de Kooning, Karel Appel or Frank Auerbach. Uploaded and manipulated on Photoshop, the image undergoes a metamorphosis of distortion and inversion. Colours are altered, formations cropped and stretched, compositions mirrored and flipped – the work is made to bend to Brown\’s will. The resultant image is projected or otherwise transferred on the surface to be painted, and provides a framework that limits what can happen next, beyond a faithful transference of colour and form. However, in Brown\’s eyes, \“the departure from the \‘original\’ occurs the moment I have the notion to paint the painting and only stops when it is finished\” (Glenn Brown in conversation with Laurence Sillars, in: Exh. Cat. Tate Liverpool, Glenn Brown, 2009, p. 140). Indeed, the liberties that Brown takes with his source material do not cease when he picks up his brush. Although he meticulously renders the brushstrokes visible in his manipulated base image, he also \“inserts impasto brush marks where none had previously existed… [adds] bright highlights… [and] thin glazes of translucent, tinted varnishes to include a feeling of depth\” (Michael Stubbs, \‘Glenn Brown: No Visible Means of Support\’, in: ibid., p.103). These manipulations, forceful insertions of the artist\’s hand into what would otherwise be an exercise in transposition, are pivotal to Glenn Brown\’s practice, and are what distinguishes him conceptually from artists such as Richard Prince and Sherrie Levine. Although there are definite appropriative strains in Brown\’s work, the process of creation and alteration is instrumental to the conceptual rigour of the paintings. The illusion of the Dionysian ecstasy that consumed the American Abstract Expressionists, the preposterous idea that these were men thoughtlessly hurling the contents of their soul onto the canvas, is lampooned by Brown, who will spend hours creating a precise, flattened simulacrum of this \‘moment\’ of inspiration. Indeed, Clement Greenberg\’s famous criticism of realism, that it is \“using art to conceal art\” could be judiciously applied to Glenn Brown\’s painting (Clement Greenberg, \‘Modernist Painting\’, 1961, reproduced in: Richard Kostelanetz, Ed., Esthetics Contemporary, Buffalo 1978, p. 196). Just as Roy Lichtenstein satirised the painters out of whose shadow he emerged with his Brushstroke paintings, which flatten and simplify the loaded gesture of the tortured abstract artist, Brown removes the textural evidence of the means of production, but retains its visual impact. The Revolutionary Corps of Teenage Jesus epitomises this effect. Included in his pivotal travelling survey exhibition which started at Tate Liverpool in 2009, the work draws its title from a little known 1999 collaborative project between Alan Vega (of the musical double act Suicide) and Steve Lironi (of the new wave/post punk bank Altered Images). 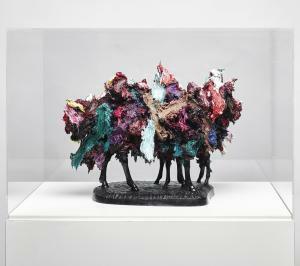 The title is somewhat ironic, as the work recalls a corpse more than a corps, with the flayed flesh and thriving flowers lending a morbid overtone to the piece. Indeed, Brown is the Doctor Frankenstein of art. He cannibalises the masters, skinning them, combining them and stitching them together. However, as Francesco Bonami, the curator of the Turin leg of his 2009 exhibition, observed, \“the experiment never works… the paintings decay in the process of coming to life\” (Francesco Bonami, \‘Paintophagia\’, in: Exh. Cat. Tate Liverpool, op. cit., p. 72). 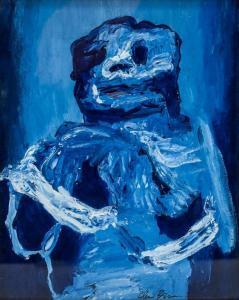 Based on a Frank Auerbach portrait inverted in the style of a Georg Baselitz painting and subsequently distorted beyond recognition by Brown\’s digital methods, The Revolutionary Corps of Teenage Jesus evinces a desperate struggle between Brown\’s source material and the final painting. 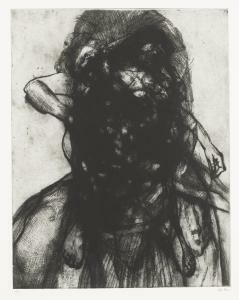 Laurence Sillars, curator of the artist\’s Tate Liverpool exhibition, described this work as \“the culmination… of a battle between subject and form\”, and there can be no doubt that the formlessness of the work is one of the principal reasons for its extraordinary presence (Glenn Brown in conversation with Laurence Sillars, in: ibid., p. 143). It presents a conundrum to the viewer; there is an upturned head perhaps, which we are sat below, gazing up the flared nostrils of the subject. Or maybe it is a foot, with what was previously the chin becoming a heel, the neck a calf. There is no definitive answer. Speaking of this tendency, the artist humorously observed \“as painting is difficult it is better to encourage the viewer to do as much work as possible\” before going on to state that formlessness \“can also be a subversive or degenerate tool. It implies that no single perception is correct… There is no perfect form, it is the slippage between forms that is important\” (Ibid., p. 144). The peculiar capacity of formlessness to effect this implication is pivotal. Glenn Brown\’s art demands that the viewer acknowledge this liminal space that he creates. It is a space not only between forms but between media, an open refutation of Walter Benjamin\’s critique of art in an age of mechanical reproduction. These are works that exist because of technology\’s capacity to reproduce, and yet they deny it the pleasure of doing so.